The mechanism and accessories are vital to the reliability of a pool cover system so they must be high quality. A quality automatic pool cover system depends on technology advancements that improve user experience, simplify engineering, and increase durability. We believe the following features provide the best quality and value. A touchpad is standard equipment for automatic cover systems, which improves safety and increases convenience. No need to worry about lost keys or unauthorized access that can result with key operated models. Simply enter a code to operate. Unlike a key switch that is constantly exposed to weather conditions causing corrosion to switch components, our touchpad components are sealed internally maximizing protection and improving longevity. Rusty keys that easily break in the lock are not a consideration for our customers with a touchpad. Pool cover motors commonly connect internal wiring directly with an external power source, which exposes the motor to water damage. Our motor connections keep external power completely separated from internal components for better water protection. Unlike drive systems with sheer pins or a slip clutch that require regular service and repair by a homeowner, our drive directly connects motor and mechanism for improved dependability. Further enhancing reliability, our drive system is protected electronically using patented technology. Some systems rely on creating operational stress in order to force the pool cover to run straight. The homeowner must regularly tighten a mechanical brake perfectly to avoid problems. Our system is engineered to open and close straight without this operational stress. 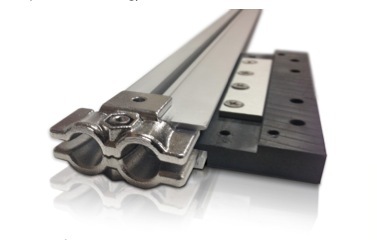 Unlike track designs that barely fit the cover edging and require use of a small slider to connect track with the front of the cover, our 3-channel track enables use of a thicker slider for added strength, durability, and safety. 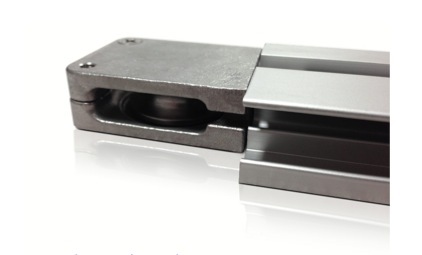 Heavy duty brackets are designed to enable homeowners to walk on upgraded coping lids. Our brackets are rated to support 600 lbs each so you can step on your custom lid with complete confidence. Some systems still use plastic guides (or similar material) that wear out quickly requiring replacement. Our hardware components use stainless steel to ensure durability and longevity. Our design keeps our covers from retracting too far.